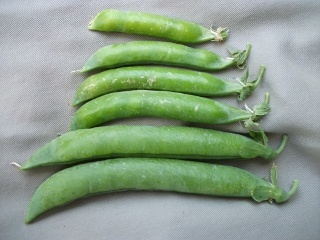 I grow my own variety of genetically diverse open pollinated land-race shelling peas on my farm. Commercial varieties of garden peas are bred to mature on the same day so that they can be harvested by machine. My peas are hand picked and mature over a few weeks so I don't get a huge overabundance on one day and nothing the next. My peas are a genetically diverse population which increases the chances that during adverse growing conditions or unexpected pest attacks that at least some of the crop will thrive. I am currently doing cross pollination experiments by hand in order to add yellow, purple, and red podded peas to my landrace. During the 2011 growing season I identified and separated out a sub-landrace that matures about 10 days earlier than the first of the main season peas.